Like a traditional artist, I’ve always come up with my own ideas and written my own stories. 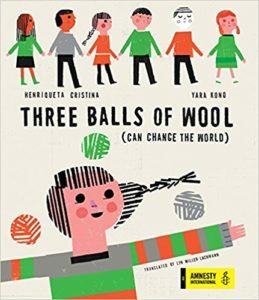 I hadn’t even thought about turning my books into a series until my editor at Curbstone, after accepting Gringolandia for publication, asked me if I’d thought about writing a novel from the point of view of Daniel’s younger sister, Tina. After he passed away, that companion novel, Surviving Santiago, took a meandering road to publication and appeared a full six years after Gringolandia — thus forfeiting much of its audience, which had moved on from YA. Kids ask me if I’m ever going to write a sequel to Rogue, and I remain noncommittal even though I don’t think such a book would be commercially viable at this point. Recently, though, someone from my publisher asked me to write an #ownvoices book featuring a character on the autism spectrum, this time a 12-year-old boy with (surprise!) a Lego obsession. 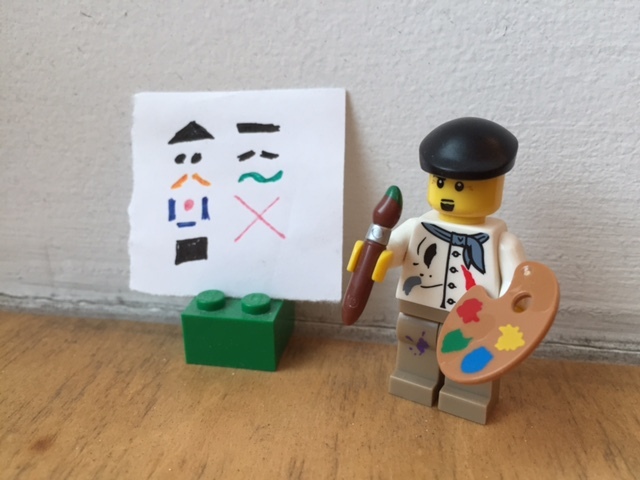 And even though writing a book from someone else’s idea strikes me as degrading the profession, turning an art into a skilled craft in much the same way that medieval artisans became skilled factory workers at the dawn of the Industrial Revolution, my Luddite principles faded in the face of an opportunity to write about one of my favorite subjects — Lego building! The need for money to buy more Lego will do that, as I show in “The Tragic Tale of Lego Piggy”. 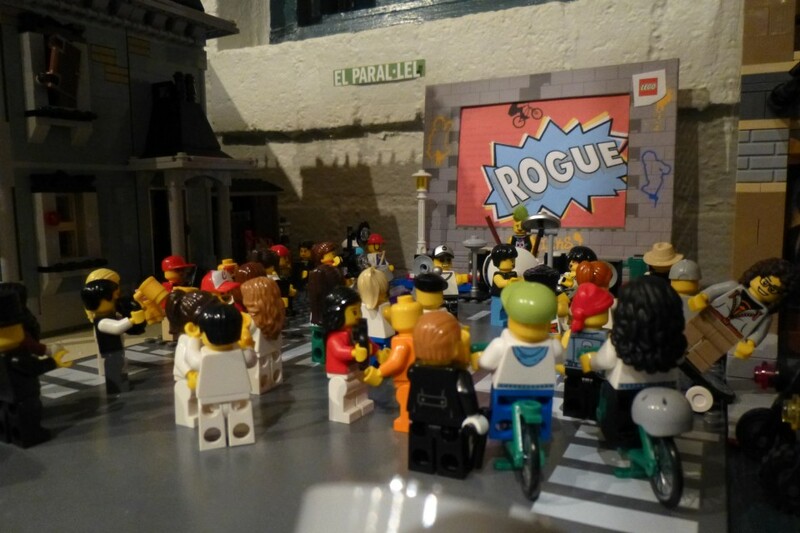 The people of Little Brick Township turned out for the launch of Rogue. In fact, I’d always dreamed of writing Lego books on themes such as City, Friends, or Racers, even though I had no idea how people came to be hired to write those books. I still don’t know. Maybe certain agents are plugged into those networks, or the publishers who produce these licensed-product titles have their own stable of authors. One of the things about being an #ownvoices author is we don’t have the same mainstream connections for a variety of reasons having to do with race, culture, religion, class, gender identity, or, in my case, disability. That’s why we’ve banded together under the hashtag and are insisting that we should be able to tell our own stories and receive the same support from gatekeepers that outsiders have. In the autism-support community, there’s a slogan, “Nothing about us without us,” and that applies to any producer of culture from a traditionally marginalized group. Even though I don’t plan to write a YA sequel to Rogue, I’m glad that a publisher has prioritized an #ownvoices perspective and given me another chance to reach a new generation of readers on the spectrum — and those who know them. 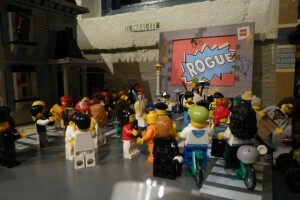 Building and photographing Lego scenes played an important role for me when Rogue launched and I was unable to organize a proper launch party with real-live people. I look forward to portraying the role that the buildings and minifigures play in the life of my protagonist who, like me, has always wanted to be the cool, popular kid in spite of (or perhaps because of) his difference. And I welcome the challenge of writing to someone else’s specifications instead of my usual practice of marching to the drummer inside my neurodiverse head. Update May 2018 — and I waited a while to post this: Six months after the person from the publisher approached me, and five months after I submitted the proposal, the publisher cancelled the project saying it “doesn’t fit with our current list.” My agent got my rights back for the proposal, and I’m considering taking elements from it for a new book. But lesson learned. Writing to someone else’s idea on spec is, more often than not, a bad volunteer job. I love that you’re working on another #ownvoices novel. I don’t see writing from someone else’s idea as “degrading” to the profession. Ideas are just that — ideas. Easy come, easy go. The hard part is the writing — the creative process — which could go in any number of directions. Write on, Lyn! Thank you, Anne! I know that in past centuries great artists were commissioned to create according to their patron’s specifications. For instance, Michaelangelo couldn’t paint whatever he wanted on the ceiling of the Sistine Chapel. But there is a difference between writing a “book of the heart” about a subject that I find personally compelling and being brought in to work on a project because of my expertise and platform. Nothing wrong with the latter. It’s just a different kind of writing. 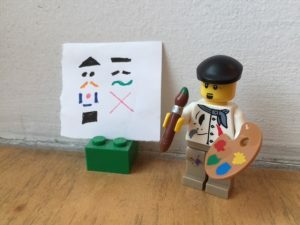 And now that I need more space for my Lego town, it makes sense to use my skills, both writing and building, in a gainful way by providing content that we know readers want. I agree with Anne, Lyn. As someone who used to work full-time for two book packagers, just because you write a book for which someone else has given you the idea, that doesn’t mean the book lacks artistic merit or isn’t somehow “your” book. Go for it, Lyn!